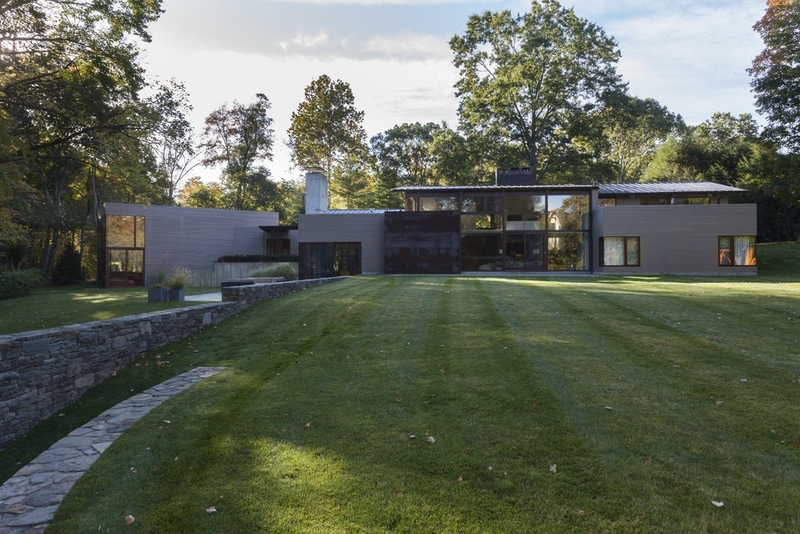 Situated on 3.5 acres with a lakefront view, this Greenwich, Connecticut, gut renovation of a prefabricated ‘Deck House’ optimizes the views of the lake and the pastoral backyard landscape. By removing the rear façade and installing a mahogany and low-iron glass curtain wall, the interior space is flooded with light. Nestled into the side of the rear yard is a sixty-foot long lap pool with an infinity edge that flows over a bluestone wall facing the lake, creating a sense of continuity between the two bodies of water. A two-inch thick piece of weathering steel hides a cantilevered steel exterior staircase that leads from the second floor to the garden below.